Physical characteristics: Chaffinches have a white shoulder patch, a white wing-bar, and white tail markings. Males are patterned with a blue-gray back and front of head, a pink-to-rust face, throat, breast, and sides, a gray-green rump, a white belly, flanks, and undertail coverts, and a gray-blue tail. Females are duller with a yellow-brown overall color, a paler colored belly, a brown eye line, and light olive-brown up-perparts. Color variations and streaking patterns occur because of wide geographical range. Adults are about 6 inches (15.2 centimeters) long, with a wingspan of about 9.5 inches (24.1 centimeters). 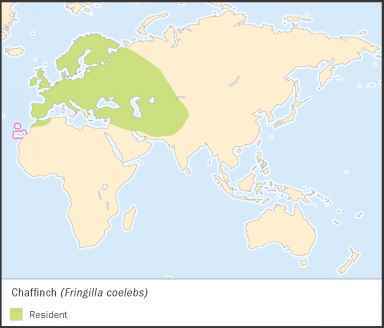 Geographic range: Chaffinches are widely spread throughout most of Europe, across the Middle East, through the Ukraine and western Russia to Afghanistan, and in North Africa, the Canary Islands, and the Azores. 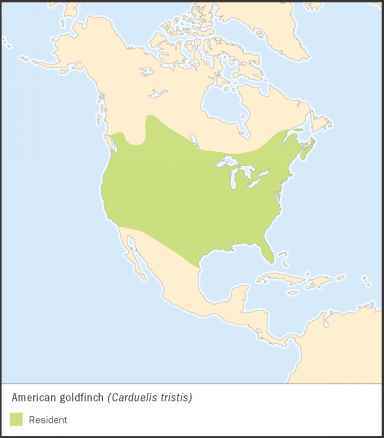 Habitat: They are found in a variety of woodlands and open forests, urban and suburban parks and gardens, and fields with hedgerows. Diet: Their diet consists of seeds (including pine) and fruits. Young chaffinches are fed insect larvae (LAR-vee), caterpillars, butterflies, moths, and other invertebrates, which are brought up from the stomachs of parents as partially digested food. They feed from trees and bushes. Behavior and reproduction: Chaffinches are found alone or in pairs during the nesting season, and in groups and small flocks after breeding. They are migratory birds and females prefer to migrate farther south than males. Their song is a bold warbling such as "fyeet, fyeet, lya-lya-vee, chee-yew-keak." Their call is a "pink-pink" and their flight call is "cheup." Chaffinches build well-hidden, cup-shaped nests of grasses and lichens. Nests are neatly constructed in trees or shrubs that are near to trunks or large branches. 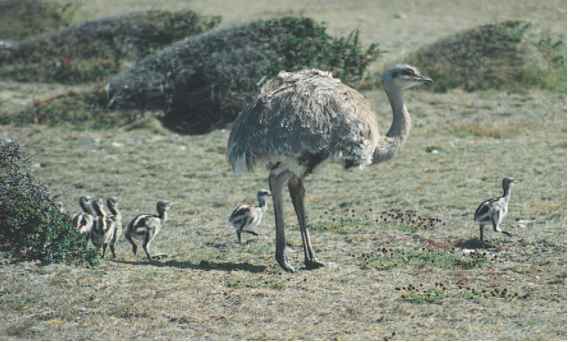 The incubation period (time sitting on eggs) is ten to sixteen days, only done by the female. One to two broods (young born and raised together) are raised each year by the pair (mostly by female). 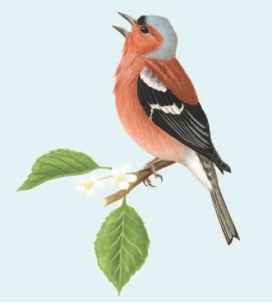 Chaffinches and people: People enjoy chaffinches for their beauty and song both in residential and agricultural areas. They have been kept as pets for their beautiful singing.